Except the size of the board (11x11), the rules are the same as for Tablut. But the difference is board size and number of pieces makes a different feel than Tablut. The image below shows how white captures 2 black rooks by playing h11 to h8. The Black player has the first move. For Black to win, the king must be surrounded on all 4 sides. For White to win, the king must reach a corner (not the board edge). 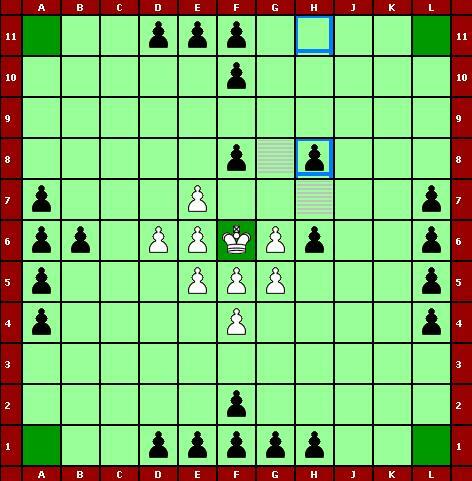 The king moves and captures like any other piece (he can participate in captures regardless of whether he is the moving piece or the non-moving piece). 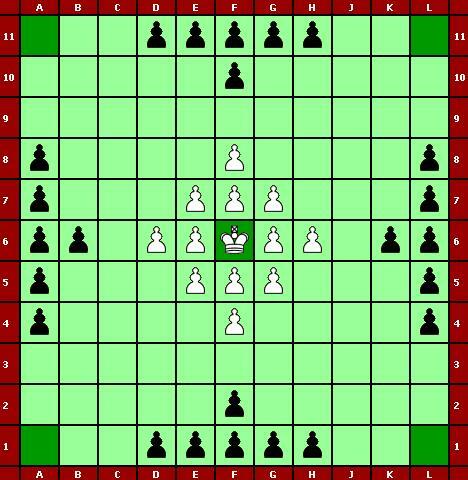 The king cannot be captured on the board edge by three enemy warriors – in order to win, the black warriors must force the king away from the board edge, and surround him on all four sides. The King can be captured by three enemy warriors on one of the squares next to the central square (throne). Only the king may stand on the central throne and the corner squares. All other pieces may move across the throne (if unoccupied) without stopping on it. The king may re-enter the throne square. A black warrior may be captured by being caught between a white warrior and the throne square, or between a white warrior and a corner square. A white warrior may be captured in the same way, except in the case of the throne square, when the king is still in place on the throne. Then, a white warrior on the square next to the throne, with the king behind him, cannot be captured by a single black warrior. However, if the king is not on the throne, the white warrior could be captured like this. If either player is unable to make a legal move (because all movement is blocked) the game is a draw by stalemate. If the same move or sequence of moves is repeated three times, the game is a draw by repetition.